Millions of older adults will develop dementia over the coming decades. The middle-agers who assume responsibility for this older generation face a looming concern: how can we keep our parents safe and at home? Can technology help make this possible? If we read the popular press on this, the Internet of Things will carry part of the load of caring for our elders. New, in-home smart systems will reduce caregiver stress through electronic surveillance, allow doctors to get real-time insights into the health of our loved ones, and improve their quality of life. Such “living labs” are already deployed and being evaluated. These new “trusted patient homes” will require a new kind of workforce of healthcare practitioners, not only persons who can read the new dashboards but also technicians who can maintain the sensors. But will these new, technologically sophisticated homes really tackle the core problem? At the moment these homes feel, to us, like new sites of isolation. They remind us of a surveillance state, albeit one that aims to preserve health. Yes, we will all have more data. Yes, we might better understand the physiological patterns of persons living with dementia at scale. But can we really improve the quality of lives of our elders with dementia and their families with easy-to-follow audio instructions piped in over speakers? Will a daughter feel safe leaving her mother alone at home in this surveilled new world? The world of continuous monitoring will bring new challenges. And the technology by itself will not be the full solution. Somewhere we have to figure out the role that old-fashioned social networks, humans checking in on humans, will play, and how technology can help augment, not replace, the role that caregivers play in maximizing quality of life for those who can no longer look after themselves. That will require a serious examination of the role of work and obligation, borne by those in middle age, and how this can fit in with the increasing responsibilities that they will inevitably bear as the population ages. We need space in the public conversation for this too. Many adolescents may benefit from training and assistance in skills that have long-term effects on overall health and well-being. The federal legislation enabling the Personal Responsibility Education Program addresses six key adulthood preparation subject (APS) areas closely linked with key social drivers of health in adulthood: family relationships, overall health, financial literacy, parent-child relations, education and career success, and life skills like goal setting. This review evaluated interventions that might strengthen one or two of these areas, although no single intervention evaluated the complete group of interventions for “adulthood preparation” outlined by the federal legislation. Schools have implemented a majority of these interventions, but they miss particularly vulnerable adolescents such as those in foster care, adolescent parents, youths who dropped out of high school, pregnant and parenting adolescents, and low-income youths. In 2002, the Veterans Health Administration initiated universal screening for military sexual trauma (MST), which is defined as sexual assault or repeated, threatening sexual harassment occurring during military service. The documentation of MST status in the medical record provides a unique opportunity to examine long-term health care services use (mental health, substance use, social work, emergency services, homeless services, and medical care) and costs as they relate to adult sexual trauma for veterans of the Iraq and Afghanistan conflicts. The overall positive screen for MST was 16.2% in women, 0.8% in men. A positive MST screen is associated with a 50% increase in health care visits and costs over a 5-year period; that’s approximately 35 health care encounters and $11,000. These findings add support to the investment in developing potent primary assault and harassment prevention efforts for veterans, particularly women. The United States throws about 40% of its food away each year, and with it, about $218 billion. Despite this, forty-one million people (1 in 6) experience food insecurity in the United States. If this waste was somehow avoided, we would be able to feed those 41 million people plus about 122 million more. The Natural Resources Defense Council (NRDC) released a report in October 2017 that details just what kind of food the United States wastes and how to recover food that would otherwise contribute to a shameful country-wide habit. One major focus of the report was on various city-level sectors such as grocery stores, restaurants, schools, and health care. 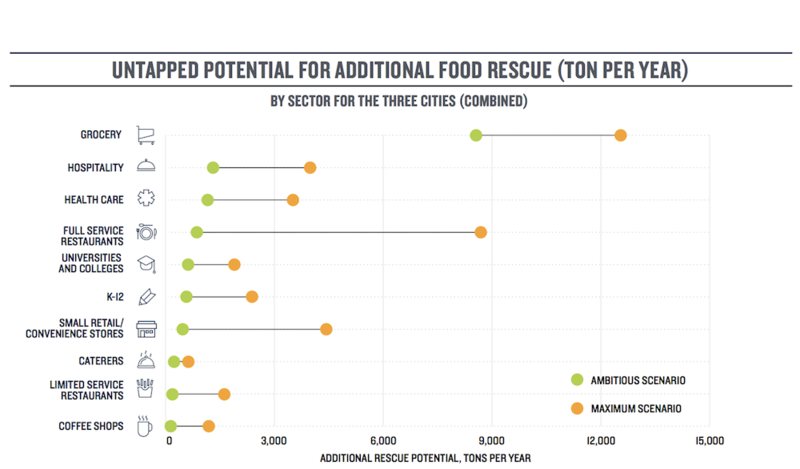 As the graph above shows, restaurants might contribute the greatest volume of food waste but have low potential for food rescue as most food is considered “post-consumer.” Grocery stores, on the other hand, could be a major source of usable, donated foods like fruits, vegetables, meat, and other nutritious foods. The Public’s Health is a publication of Public Health Post at the Boston University School of Public Health. Sandro Galea, MD, DrPH is Dean and Robert A. Knox Professor and Michael Stein, MD, is Professor and Chair of the Department of Health Law, Policy, and Management at the Boston University School of Public Health and Executive Editor of Public Health Post. Opinions in The Public's Health are Sandro’s and Michael’s alone and do not represent School policy.